Cloisonne jewelry – Enameled Butterfly Necklace in 14k Gold with Bolder Opal. Butterfly is a cloisonne jewelry piece created by Patsy Croft. It belongs to Holiday collection of amazing enamel jewelry with unique jewelry designs. Butterflies conjure up images of sunshine, the warmth and colour of flowery meadows, and summer gardens teaming with life. And this enameled butterfly necklace brings a smile to the client as she wears it each day. 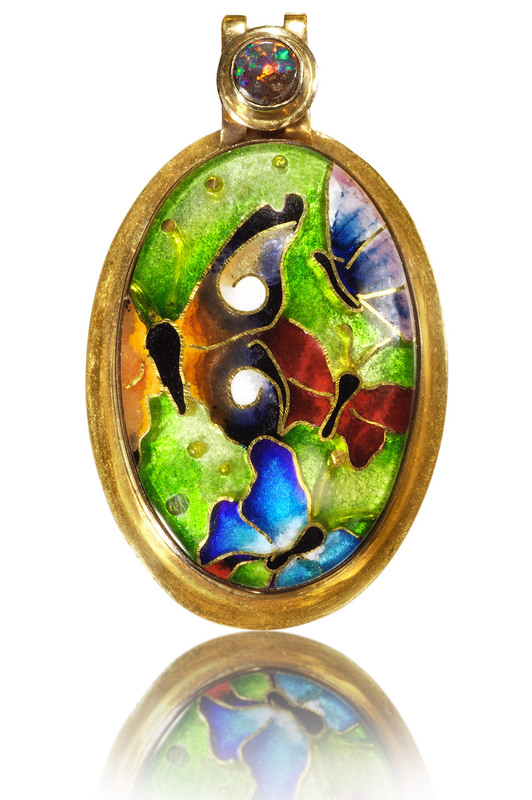 Cloisonne jewelry is great way to recreate the butterfly in a wearable art form. Enamels speak of color as butterflies do, each advertising their distinct colors. Butterflies possess some of the most striking color displays found in nature. As they fly from flower to flower gathering nectar, their brightly colored wings seem to shimmer and change colors before your eyes. … A butterfly’s rich color can act as camouflage, mate attraction and warning signal. As for how we humans perceive those brilliant butterfly colors, it depends. Some color we see is the insect’s true pigment, and some is structural, or the way light reflects off a surface. When you see blue, purple, or white on a butterfly, that’s a structural color, while orange, yellow, and black are pigment, Prudic says. As the structure of the butterfly can enhance colors to appear iridescent so can the structure of an enamel jewel. With the fine silver plate as a structural foundation which the enamels lay on, domed, the light is reflected better to enhance the color to sparkle. Making this cloisonné jewelry necklace eye-catching. Contact me to have your jewel of nature created.